My friend Hank Shaw is a journalist, hunter, forager and author. Recently he published an essay on what we think of as the most boring meat imaginable, the chicken. He excoriates those who brought this once noble bird to its current lowly state, and makes the case for why we should gladly pay $5 a pound for it. He gave me permission to post an excerpt, and I encourage you to click through to read the entire essay. I bought a chicken the other day. To virtually every other American, this is an event akin to taking out the trash, or driving to work — a commonplace barely worth noting. But there’s something you should know: I have not bought meat for the home more than a handful of times over the past decade. So buying any meat is very much an event for me. You might ask why on earth, of all the things that I could have chosen to break my self-imposed fast on domesticated meats, would I buy a chicken? Because of all the flavors I miss from the store-bought world — ribeyes, skirt steak, a huge pork chop, shrimp — chicken is the one I long for most often. Chicken. You read that right. Chicken deserves respect. 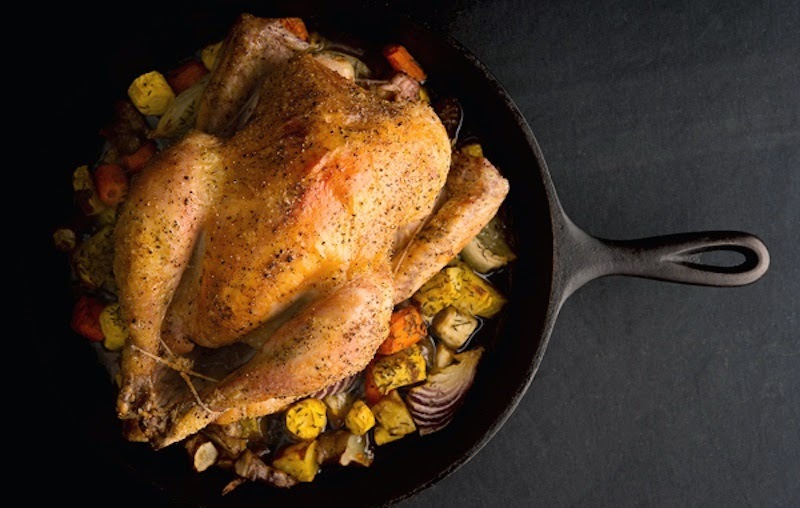 It deserves to be reclaimed by the culinary world for what it has been for most of human history: A bird worthy of a king’s table, a gift for cooks to work magic on. A platter of home. The modern chicken has a breast so big it can barely walk or fly. It’s lethargic, to the point where even if a farmer gives it pasture to roam it won’t. It grows with frightening speed: In 1960 it took about 5 months to raise a meat chicken for market. Now it can be done in 6 weeks. In 1925, a chicken needed to eat 4.7 pounds of feed to gain 1 pound. Now it only needs to eat 1.9 pounds of feed to gain the same pound. Only tilapia, the Soylent Green of fish, has a better feed ratio. This is the chicken you eat. And we Americans eat a lot of it. Chicken topped beef as America’s favorite meat in 1992. 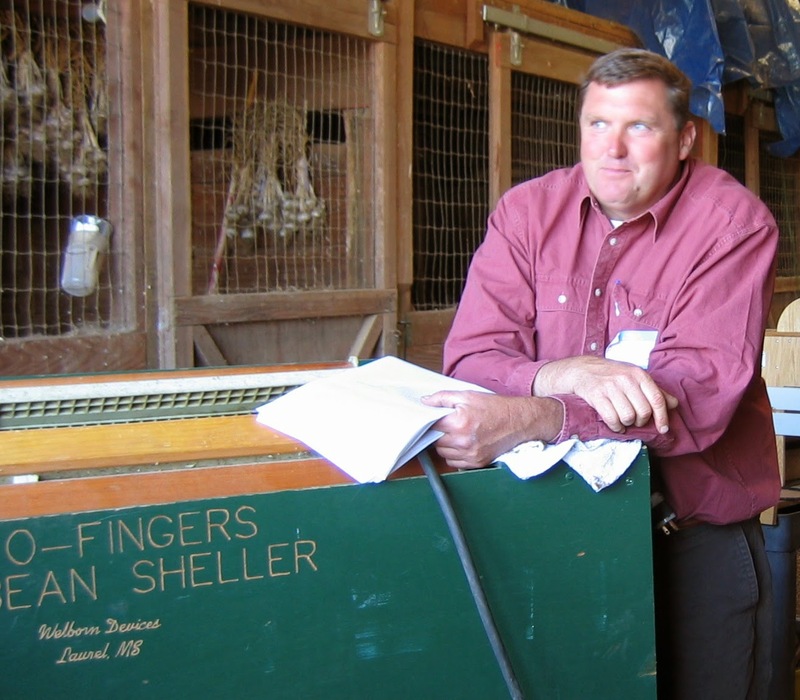 In 2006 we ate an average of 87.7 pounds of these birds, the highest poundage on record. And as you well know, we are not eating all this chicken as a whole bird. No wonder the average consumer recoils in horror at the notion of $5 a pound chicken. Chicken has become our baseline, our lowest common denominator of meat. It’s our daily bread, a right like free bread in ancient Rome or free gas in modern Saudi Arabia. Top photo by Holly A. Heyser. 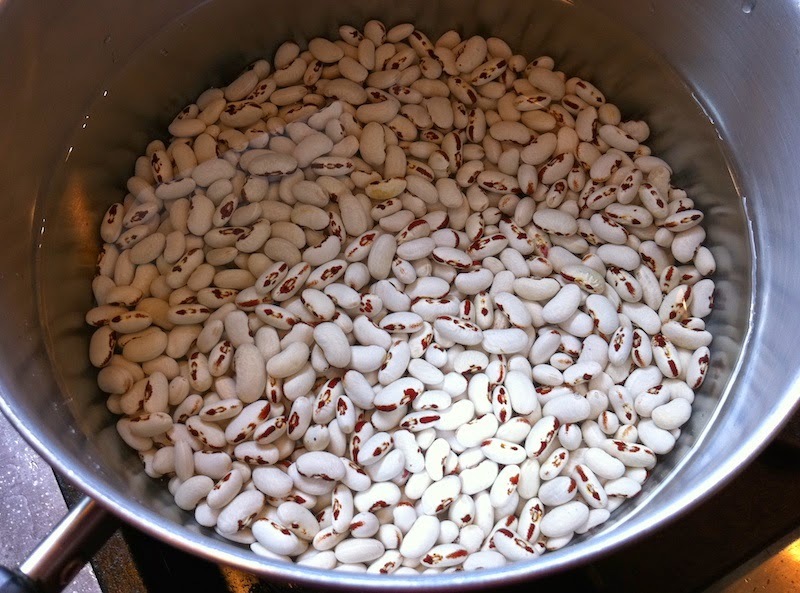 Contributor Anthony Boutard shares a primer on the beans he and Carol grow at Ayers Creek Farm. Following on the heels of many inquiries, here is the latest version of our bean propaganda as handed out at the recent Variety Showcase put on by the farming impresario Lane Selman and the Culinary Breeding Network. 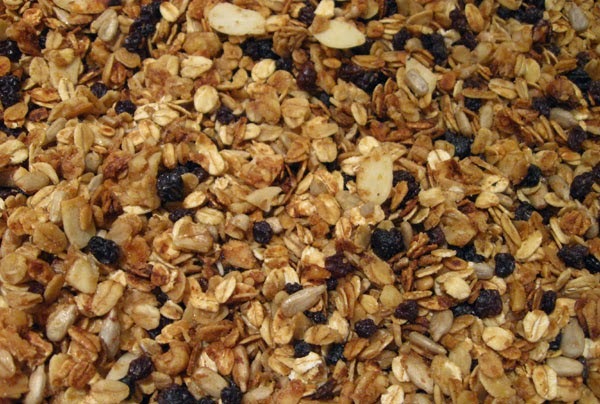 All of the beans and grains sold at the Hillsdale Farmers’ Market are grown by us on the farm. 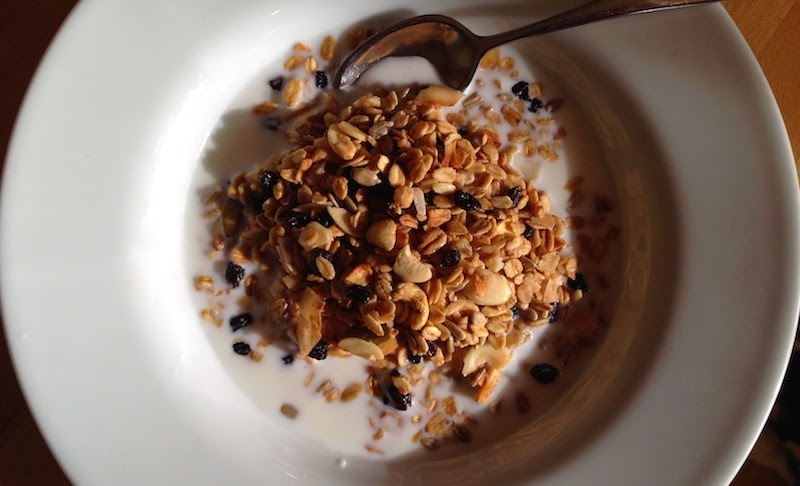 We do not repackage other farms’ production or buy bulk beans for resale and we are certified organic. 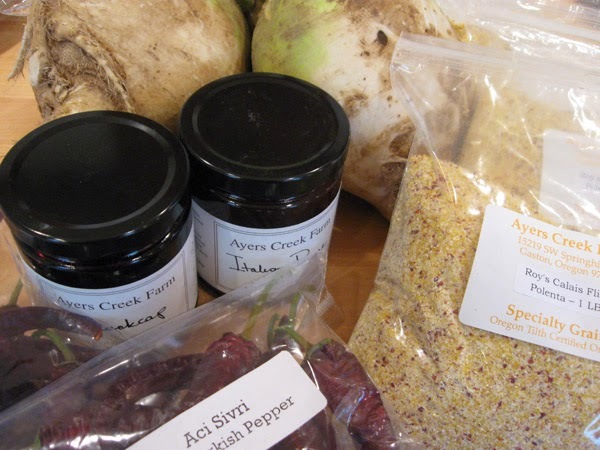 A theme running through Ayers Creek’s grains, legumes and vegetables is adaptation to our latitude, the 45th parallel. We look to maritime-influenced regions such as the Bordeaux and Dordogne in France, Galicia in Spain, the Po River Valley of Italy, parts of the Danube Valley and Hokkaido, Japan. We are not bound by such an analysis, but it is a useful vetting mechanism. Our primary selection criterion is a bean that can be savored on its own, just a bit of salt and olive oil. Over the last 12 years, we have grown a wide diversity of dry beans; the beans below we deem worth growing. Cute stories and pretty color patterns don't carry much water with restaurants or habitual bean eaters; the flavor and texture are everything once it gets to the plate. Soaking? Recommended, but not mandatory. We prefer soaking the beans overnight before cooking. The bean is a dormant, living plant. When you soak it, the plant opens up its toolkit of enzymes and starts to break apart the large protein and carbohydrate molecules that store its nutrients and energy. In our experience, soaking lends the bean a discernible sweetness and a smoother texture than just hammering things apart with heat. We treat soaking as an elegant step in the process rather than an inconvenience. However, with a good bean, it is best to cook it however you want. If the ritual of soaking irritates or crimps your style, relax and follow some other method and hammer away. Regardless, you are not affecting the nutritional value if you soak the beans and toss out the soaking water. 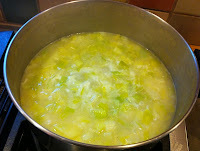 The next day we drain them, add fresh water, bring to a boil and then simmer until tender. Time varies by variety and age of the bean. 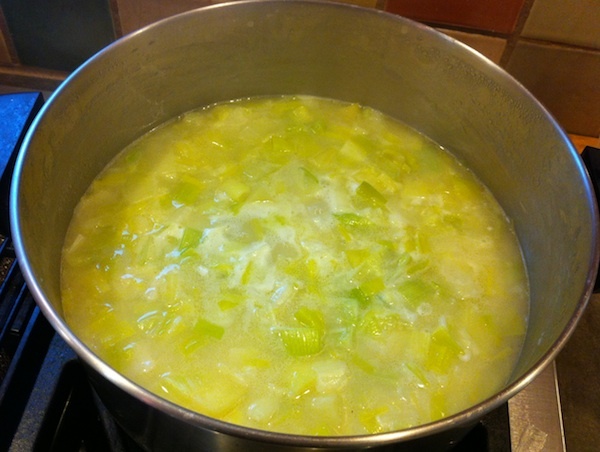 You can also add herbs, carrots, onions and celery to season the beans. If the dish calls for meat, we generally cook the beans in water first so they retain their own flavor. Avoid cooking beans in an acid liquid such as tomato sauce because they will not cook properly, remaining tough and grainy. It is fine to add salt whenever you want. We follow the late Judy Rodgers suggestion to salt the cooking water to taste. Refrigerate the beans in their cooking liquid. Anthony and the Roto-Fingers Pea-Bean Sheller. The church on the way to town has one of those boards updated with infuriatingly banal dictates. This week, it tells us "freedom isn't doing what you want, it is doing what is right." In our world of beanality, freedom is cooking beans exactly how you want; that is the right way. Unless you want to get really, really sick because of some ordeal poison fetish, though, never, ever eat them raw. Borlotto Gaston. Result of a decade of work on the great Borlotto Lamon (top photo). It is a superb in every respect. We have been selecting for earliness, short harvest period and four-bean pods. The last trait is very import determinant of flavor and texture; more is packed into fewer seeds. Chestnuts spring to mind as a description of the flavor. A key ingredient for La Jota and Pasta e Fagiole. Black Basque. 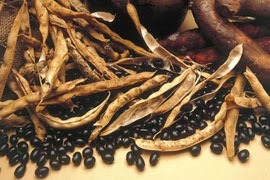 A black bean derived from the Spanish ‘Alubia de Tolosa’. The flavor is rich, sweet with a slight hint of chocolate, and with a silky texture. The flavor and texture is unlike any other black bean. Unfortunately, the supply is very limited this year. Bianchetto. A medium, round white bean with excellent flavor and smooth, dense texture, buttery as opposed to creamy. A very fine bean, though aesthetically not the prettiest. Tarbesque. Our selection of the French bean called ‘Tarbais’. Good flavor and texture, it is one of the beans traditionally used in the cassoulet. It holds up to long cooking; a trait which is essential to certain dishes. As with the black Basque, the supply is very limited this year. Dutch Bullet. We started growing this variety (left) at the suggestion of Kaas Sahin, the late Dutch plant breeder (Bull's Blood Beet was one of his varieties). The lowlanders like it because, as he noted, there is no flatus after eating it, as if that is a virtue for the more childish of us. Actually, none of beans we grow are particularly prone to creating such gastric maelstroms. We describe it is as the best of a red kidney bean without any of that bean's many flaws, or flatus. Dutch Bullet is thin-skinned with a fine texture and a well-balanced bean flavor with a pleasant sweet edge. It is dark yellow with a red eye. 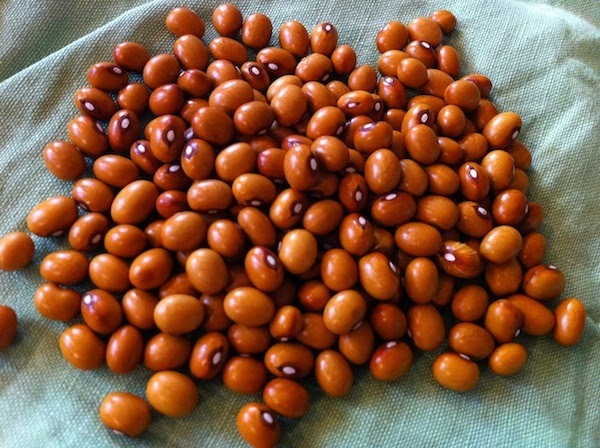 A versatile bean which is very popular with our restaurant accounts. Zolfino. A light yellow bean identified with the Pratamango River Valley of Tuscany. Vastly superior to the cannellino, or white kidney bean. 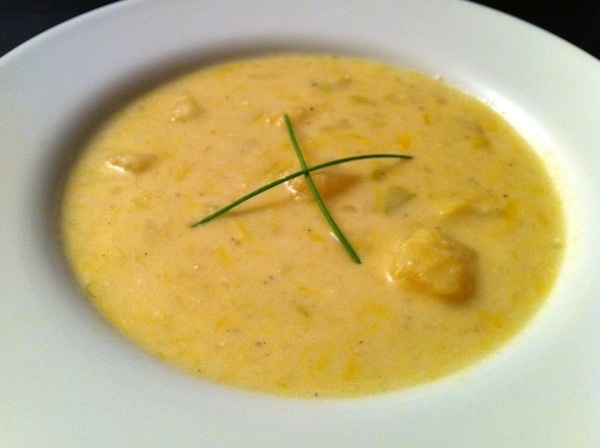 The bean is thin-skinned, very creamy in texture and is best served as a simple white bean soup. No meat, just the beans, an herb (sage, thyme, or rosemary) and olive oil. Purgatorio. 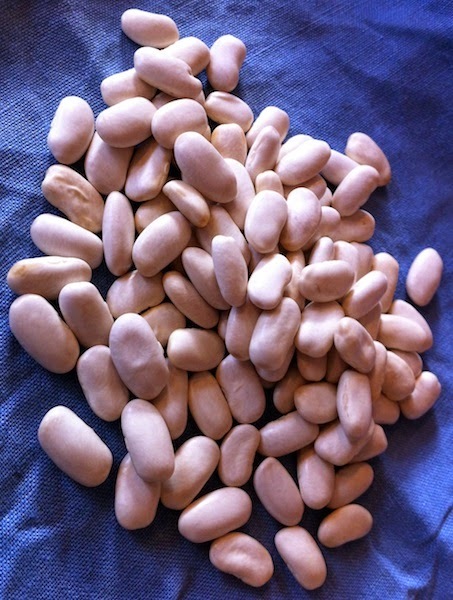 A small, white bean from Gradoli, a town in the Lake Bolsena area of Italy. The name apparently refers to the fact that it is excellent with seafood, an uncommon trait in beans, and hence well-suited to the observance of the Lenten fast. Someone also mentioned detecting a hint of sulfur in the first stage of cooking, a plausible Dantesque explanation. 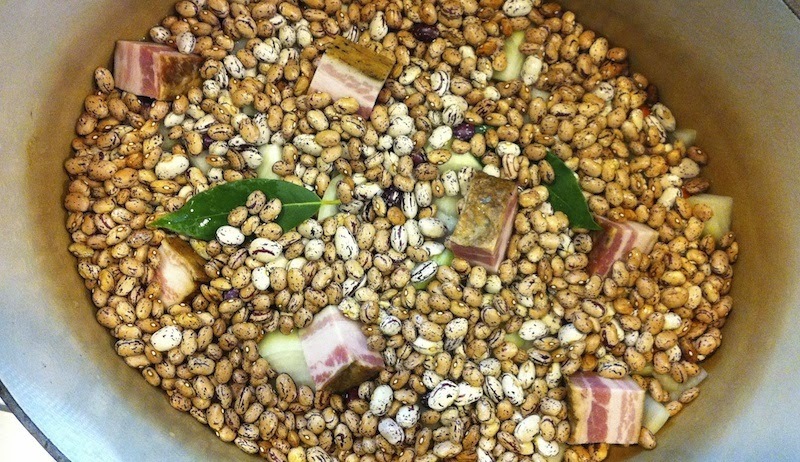 These beans were recommended to us by Cesar Benelli of the restaurant Al Covo in Venice. Not only does the delicate flavor work nicely with seafood, the skin is thicker and more distinct than that of our other beans, which lends a nice texture when mixed with soft fish. Closer to home, Cathy Whims of Nostrana makes a lovely seafood soup with fish, a hint of cumin, sautéed onions and the beans in their cooking broth. It's Thanksgiving week, and all the foodie media outlets are trying to sell you their take on the holiday meal. "37 side dishes your family will love!" "Vegans coming for Thanksgiving? You don't have to kick 'em outside to enjoy your meal in peace." "Pumpkin pie like you've never seen it before!" But what about all the other meals you have to make over the very long weekend for all those visiting relatives and friends? No one talks about that, do they? Well, I'm jumping in with the easiest of easy things to make to get all those people off to a hearty start on their day, and they'll even be able to serve themselves so you don't have to get up and commence rattling pans and cracking eggs. Plus even after all those people are gone and the house is quiet again you can make it for yourself and your family and freeze it for enjoying whenever you like. This recipe was created by my mom for the now-legendary Shakers Café, my brother's restaurant in the nascent Pearl District that boasted long lines and bellies full of classic American food. You can make it as is, or add your own mix of nuts and dried fruits or serve it plain with a smorgasbord of condiments to customize the mix. It's great with milk or yogurt or all by itself, but the best part is that the work will be done ahead and you can sit back and accept the flood of compliments. Melt butter in small saucepan. When melted, remove from heat and stir in cinnamon, vanilla, orange juice and honey. All farmers must use their powers of divination when predicting not only which crops will do well in the coming growing season, but also what market customers will be looking for in the future. Contributor Anthony Boutard has a pretty sterling track record on both counts, as the line that forms at the Ayers Creek Farm stand—even before the bell rings—at the Hillsdale Farmers' Market attests. 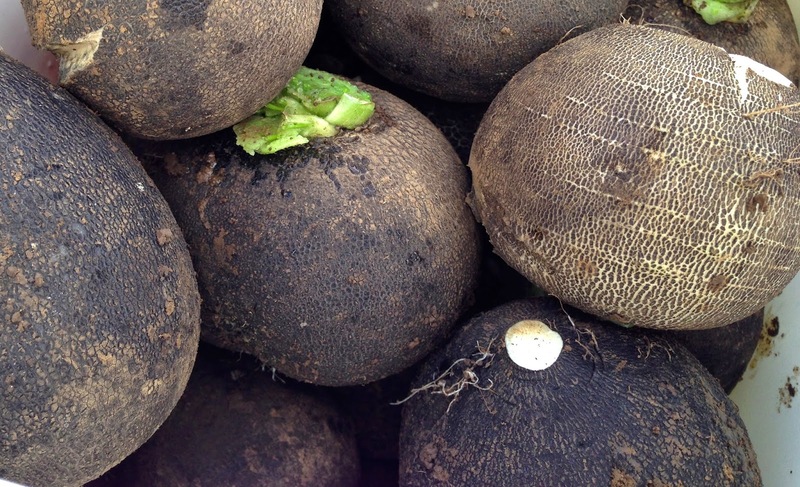 Around here, we have a hunch that black radish is the kale of the future, one of those dismissed vegetables that will suddenly become a must-have because it is packed with outstanding nutritional qualities. In particular, it is renowned as a liver stimulant, which is why it is favored in northern European countries where the winter diet is rich in pork fat and the denizens imbibe beer generously to warm the gloom of the shortened day. Crap, that sounds just like Portland. 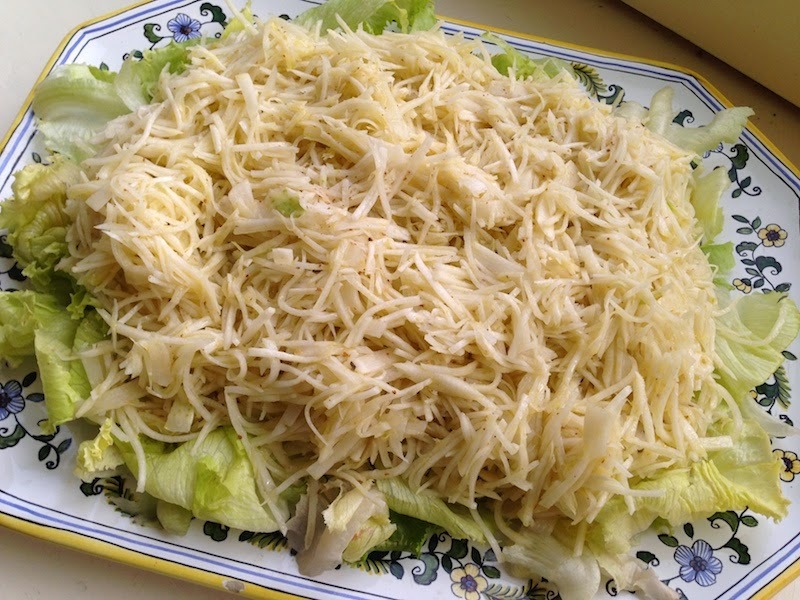 Shredded black radish salad with vinaigrette. To prepare it, we shred the root—peel on—with a mandolin and then salt it heavily for a half hour or so. This tempers its wilder, harsh nature and tenderizes the flesh. Rinse the salt off, then dress it as a salad with either lemon juice and olive oil or with a dab of sour cream. Treat it as you would a pickle, a nice morsel on the plate. Today, Sylvia and I had a mixed root salad with black radish, knob celery and carrots to accompany our purgatorio bean soup. Adds a peppery crunch to pizza, too. My father grew black radish and had a special German tool that sliced the root paper thin. He would salt the slices as an accompaniment with beer, and as kids we loved their sharp flavor even before attaining drinking age. I have not travelled in Germany during black radish season, but he told us that the taverns always served these radishes to keep beer steins empty, and to keep the livers working well. A healthy symmetry. Some people cook them, but that is, for the moment, beyond my ken. Maybe we can get Linda to figure that out. We keep onions, spuds, roots and greens in a cool, shaded, moist location. A breezeway or overhang that catches a bit of rain on a gust is good. A garage is okay if the roots are kept moist. Throw a wet dish cloth or two on top of the roots. Do not let the roots freeze, though—bring them in for the night if gets very cold. Onions, on the other hand, are amazingly resilient. They can freeze hard as a stone and are just fine, thank you. Our cornmeal is stone-ground from the whole grain, so it is high in perishable oils and provides an irresistible bouquet for pantry pests. The meal is best stored in a mason jar in the refrigerator or freezer. * Glass protects it against odors from other foods. Frikeh lasts longer stored in this manner. Mature beans and grains do well in a cool, dark place, not damp, but not very dry either. The cellar or garage is not a bad location, provided it is protected from rodents. It is not necessary nor do we recommend refrigerating or freezing them. Cayennes can be stored in the same manner. We deseed and remove the membrane from some and keep them in a mason jar in the kitchen, grinding them as needed. 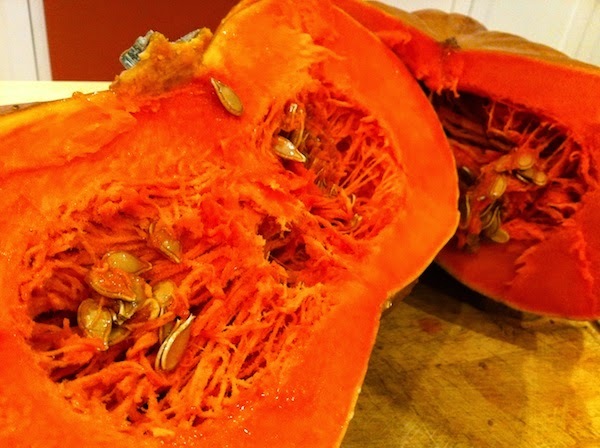 Whole squash and sweet potatoes are organs of tropical plants, and die if kept in a cold place. They will last upwards of a year on the counter in the kitchen. Keep them at 60°F (15°C) or above. Both organs reach their peak quality in December and January. Do not bother trying this with Brand X sweet potatoes as they may have been put in cold storage and thus are physiologically dead already. Ours are treated with kid gloves because we propagate the new crop from them. We don't even put those we plan to sell into the van until we are ready to leave for Hillsdale, lest they get chilled overnight. Sliced squash will hold a few days in the fridge. Otherwise, cook it and freeze the puree until needed. Preserves unopened last well nigh forever in a cool dark location. Once opened, into the refrigerator they go. A couple of years ago, Ginger Rapport, market manager of the Beaverton Farmers Market, decided it would be fun to demonstrats how customers could make a whole holiday meal from products sold by the market's vendors. 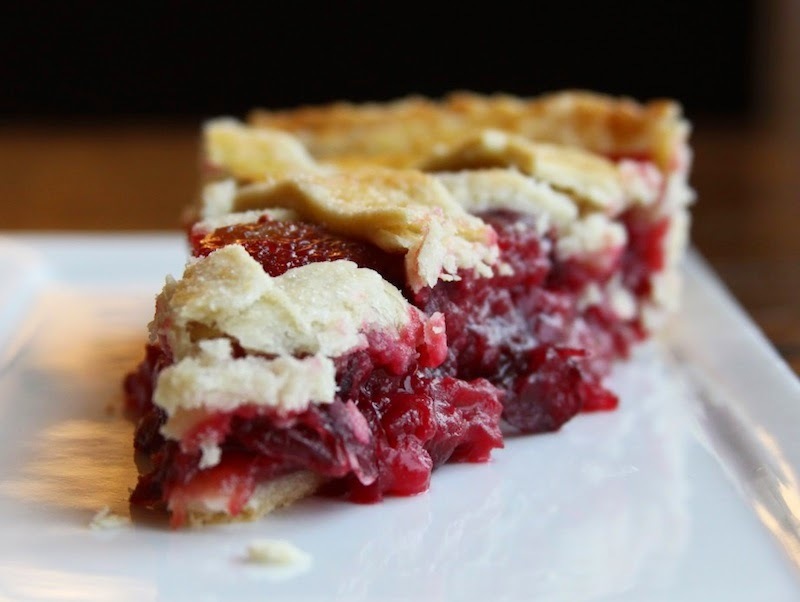 To go alongside the sweet potatoes, vegetable sides and turkey, she featured a cranberry jelly made from the whole, fresh organic berries grown by Scott Ridle and his family at Eagle Organic Cranberries in Bandon. That sauce was so popular that Erin, Scott's niece and the one who runs the farmers market portion of the business, has handed out the recipe to eager customers ever since. Some have admitted to her that they will make the sauce, then pour it into cans ahead of the arrival of their relatives who might otherwise look askance at anything that doesn't have the rings from the can imprinted on it. The Ridles (pron. RYE-duhl) have owned the property since the 1930s, when Scott's great-grandfather, a doctor, was given the land by a grateful patient as payment for his services. And there it sat for sixty years, passing down through the Ridle family until Scott, who'd been considering becoming a doctor, thought better of that plan and decided to move out to the property. Clearing land and building a barn and a house from lumber he milled from the trees on the site gave him time to consider what to do with it. 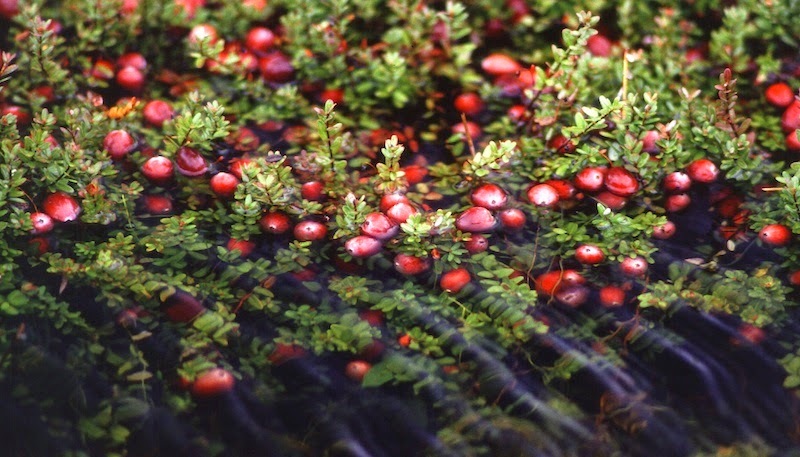 With cranberries a big agricultural crop in the area and with access to fresh water for irrigating bogs from a natural spring on the property, Scott decided to try his hand at growing cranberries. 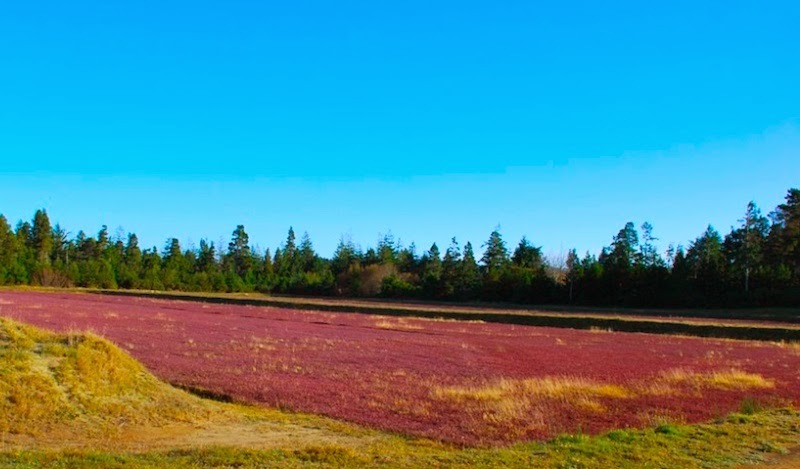 Since there were very few local organic cranberries available in the 90s, he decided to go for organic certification, a process that was made easier by the fact that the land had never been farmed before and the soil hadn't been compromised by chemical inputs. That organic certification, of course, meant he couldn't use the sprays commonly applied in conventional operations to kill weeds and pests, so the family weeds the five acres of bogs by hand and uses water from the spring to occasionally flood the bogs for irrigation and pest control. They dry-harvest their berries, which Erin said gives the berries a firmer body, rather than flooding the bogs and skimming the berries as they float to the surface. 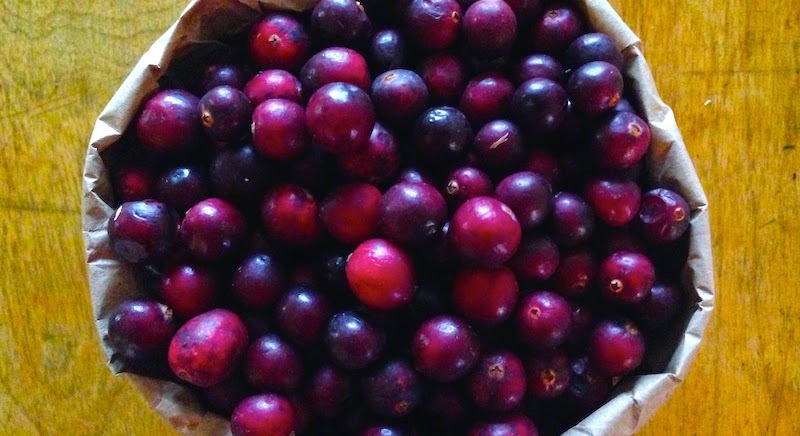 They also never package their cranberries in plastic, preferring instead to sell them in paper bags that wick moisture away from the berries, helping to maintain their signature firm texture. Because the farm is so small and organic is in such high demand, there is almost never a remainder crop left after the holidays. So if you want some of the Ridle's cranberries, your best bet is to get them in the days leading up to the Thanksgiving holiday. Erin said that in a typical year, all of the berries are sold then, with rarely enough to go through Christmas. 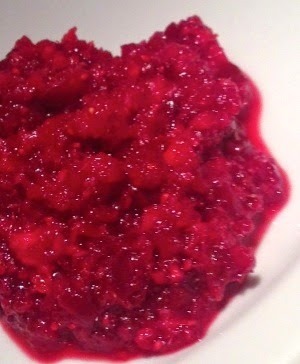 And here's that jelly recipe, whether you plan to put it in cans and fool your guests—or not. Details: Eagle Organic Cranberries available at the Beaverton Farmers Market, the Hillsdale Farmers' Market and the Portland Farmers Market at PSU and at these stores. Bring to a boil, cover with lid. Boil 3 or 4 minutes or until skins burst. Put them through a food mill. Return pan to heat. Boil about 5 minutes, until thick, skim, pour into bowl or a mold sprayed with pan spray. Much to my chagrin, I hadn't met Sarah Minnick until just a few weeks ago. 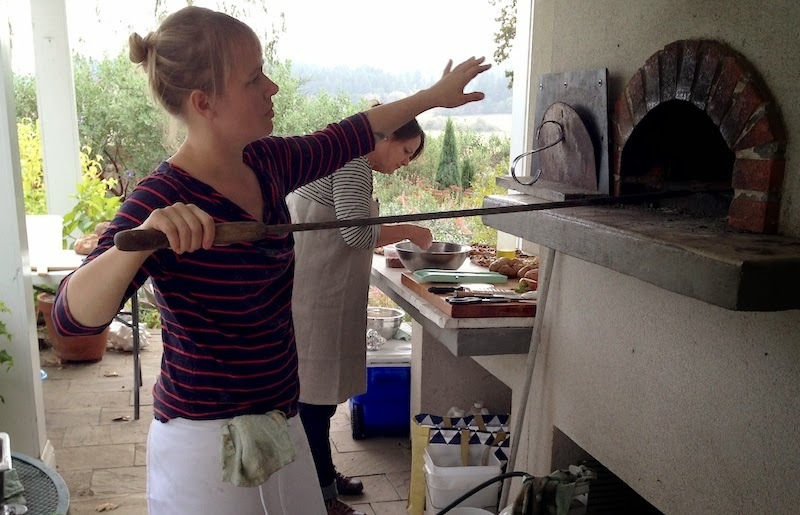 She was ably manning the woodfired oven at Ayers Creek Farm (below left), having made its acquaintance a few scant hours ahead of having to crank out dozens of pies for people attending the farm's annual Ramble. Sarah working her oven magic. She'd built the fire and was trying to suss out its individual peculiarities—hot spots, cold spots, timing—by making a few test pizzas. Nicely blistered and oozing with the incredible flavor of the farm's tomatoes and greens accentuated by Fraga Farm's goat cheeses, these were some of the best pizzas I'd had anywhere. By the end of the day, with the oven and chef having settled into a mutually copacetic groove, I'd made a vow to get myself and Dave over to her pizza joint on Mississippi, which she owns with her sister, and have her pizza in situ. 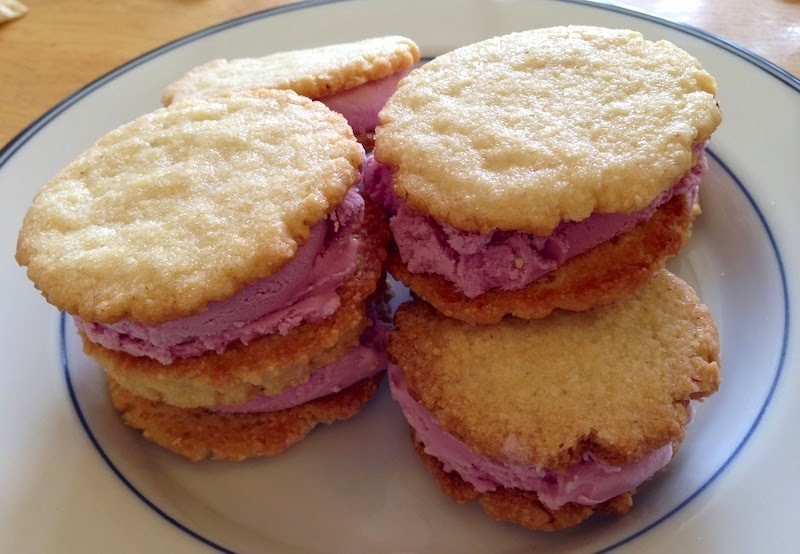 Cornmeal cookies with Chester blackberry ice cream for the farm tour. 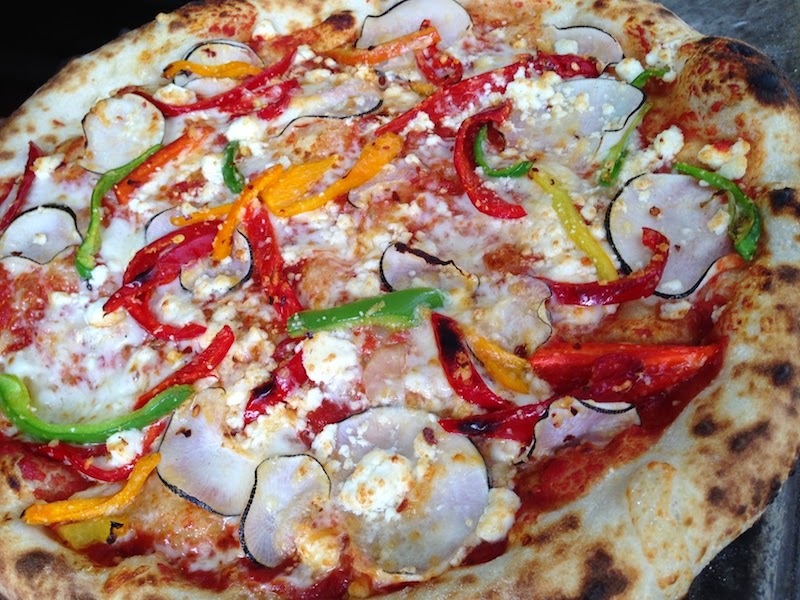 Black radish, peppers and soft cheese pizza on the farm tour. We ordered their classic housemade fennel sausage pizza with braising greens and rosemary (top photo) and it came out just as I'd remembered it from the farm…the dough blistered with a pillowy rim, the base not crackery-thin but not too thick, the amount of filling in the just-right category, with plenty of there there and ever-so-fresh. Our side of wood-roasted cauliflower with golden sultana raisins and frenched almonds was toothsome (i.e. not cooked to mush) and slightly smoky, with a sweet-tart tang from the raisins and a crunch from the almonds. I'm going to be working on a version of this at home, for sure. 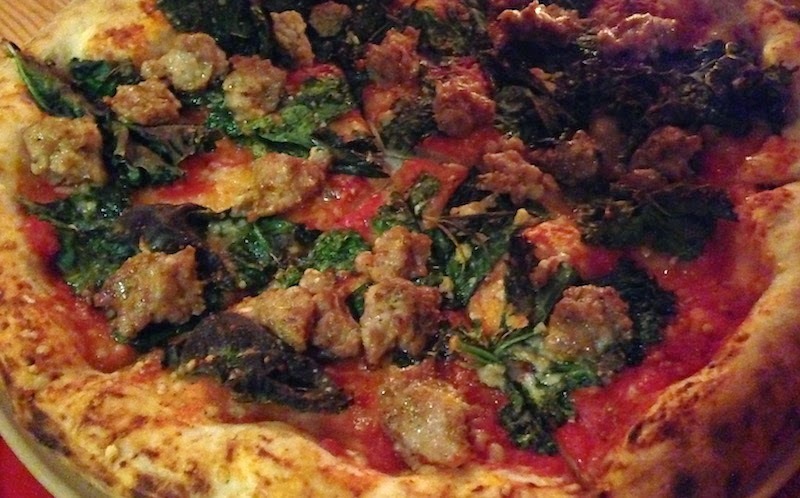 When it comes to using locally sourced, seasonal ingredients, there are only a couple of other places in town that can compare with the 'za coming out of Sarah's oven. We're lucky that her place is just a few blocks from our front door—it's taken me long enough to get there, but you can be sure we'll be stopping in regularly from now on. 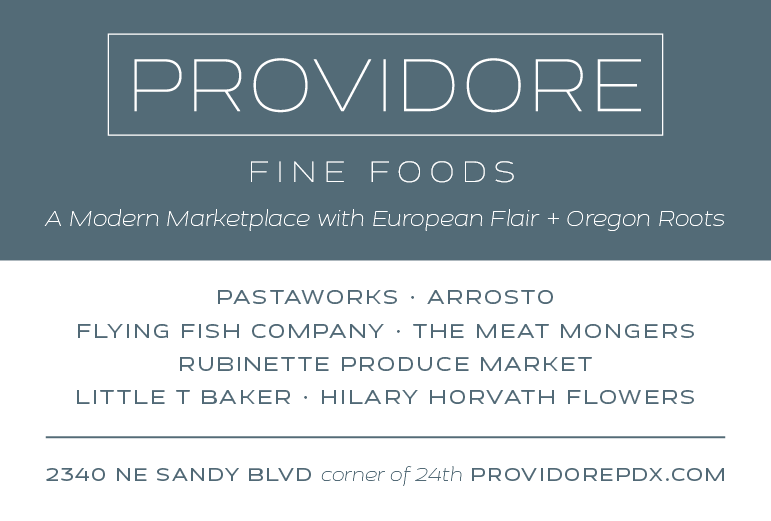 Details: Lovely's Fifty Fifty, 4039 NE Mississippi Ave. 503-281-4060. 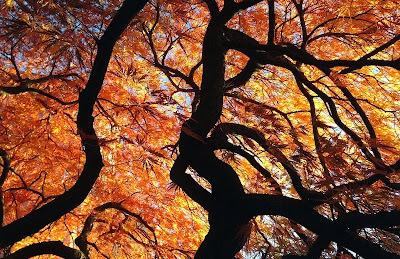 I love my afternoon walks around the neighborhood with the dogs, and this time of year is particularly spectacular. Get out if you can and see what's going on in your neighborhood! 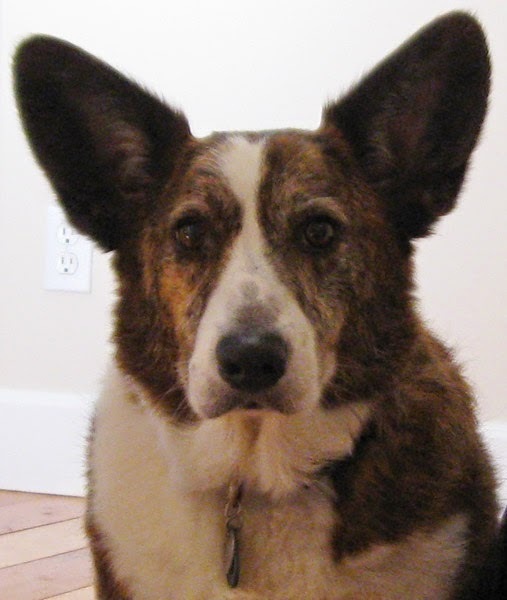 Rosey, our first Cardigan Corgi—the clincher, in her case, the one who spoiled us on any other breed, odd since we're not the purebred types, being mutts ourselves—aka Rosey Toes (or just Toes), Miss Rose, Our Princess, Rosey Roo…the list goes on. After our first dog, a lovely Husky mix named Nikki, passed on at an advanced age, I was ready to downsize. I'd met many Corgis of the Pembroke persuasion, the smaller, docked-tail dogs that are the familiars of the Queen of England and, while I liked their size, I (no offense) was put off by what I perceived as their yappier, snappier personality. I met my first Cardigan, a dashing fellow named Tai, with a jaunty flag tail and generous nature and thought, "This is the dog for me." She went on to bear four litters of pups, many of whom then became champions in their turn and bore champions of their own. 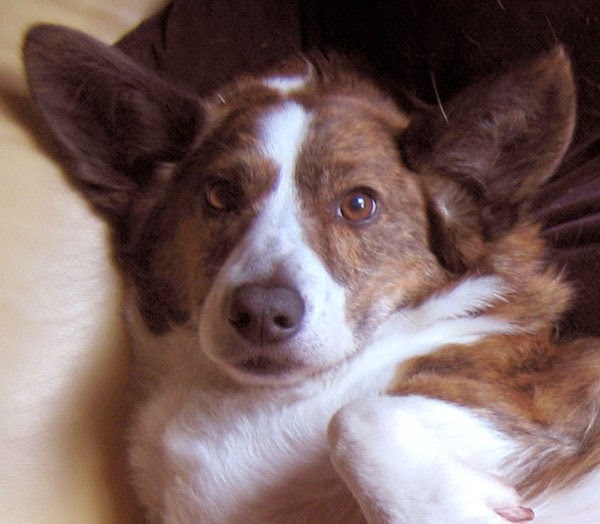 Her longterm lover, and, in dog terms, her husband of long standing, was the superstar Carbon Blue, the first Cardigan Corgi ever to win Westminster. Seeing them together and so besotted was a thing I'll never forget, a lifelong love affair that continued until he passed on four years ago. Despite the monikers enumerated above, I always thought of her as a bustling house manager in a Downton Abbey-type manor, all petticoats and black skirts as she kept the youngsters in order and the house running smoothly. 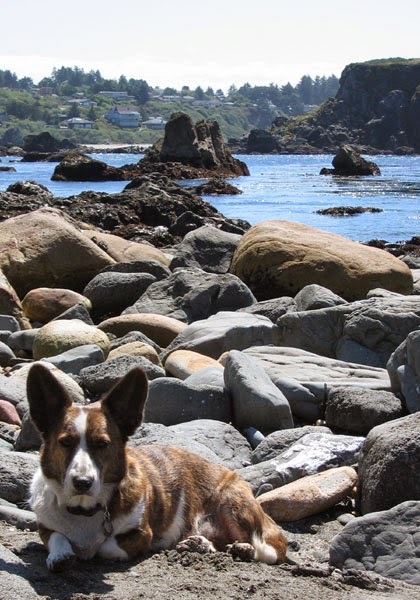 In her later years she settled into dowager mode, still able to keep up with the younger set on long hikes in the woods, pointing out squirrel nests and bird species, but not above a romp on the beach (her favorite) or digging a den in the dirt at a campsite. 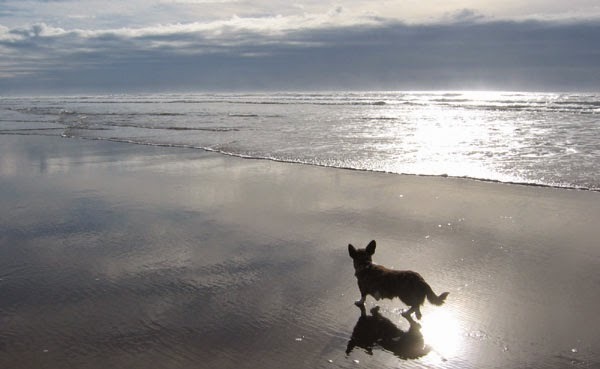 Today was a sad day at our house as we said goodbye to this most graceful and fun-loving of her breed at the ripe old age of fifteen-and-a-half. Ten years with her was not enough, and we will miss her mightily. You don't need a spreadsheet to tell you that short ribs are the pinnacle of what braised meat should be. 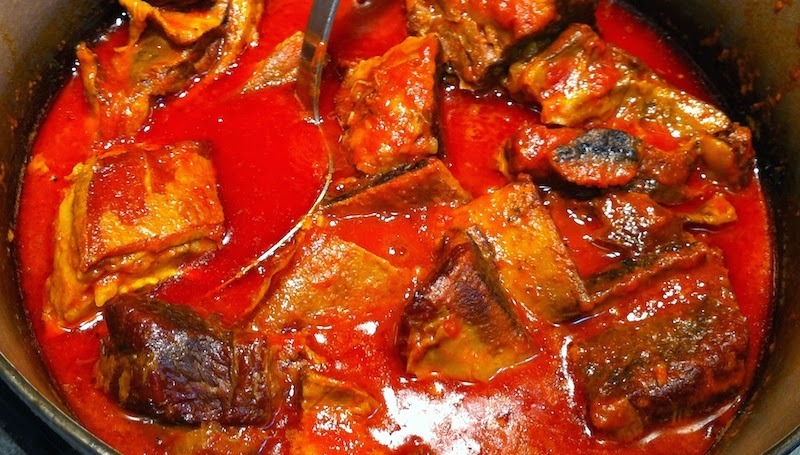 All you have to do is walk into a kitchen, your very own or, lucky you, that of someone who's invited you to dinner, the air thick with the rich aroma of a long-simmered sauce, slightly caramelized on the edges of the pot where the liquid has reduced down to its exquisite essence. I'd clutched my memories of the beauty of this past summer's astonishing weather close to my heart, trying to prolong the warmth and sun, but eventually they simply faded in my arms and I had to admit it was, indeed, late fall at last. But remorse at this loss quickly turned to thoughts of the quarts and quarts of roasted tomatoes in my freezer, each one a condensation of that sensational weather waiting to be revived. So please bear with me as I make my way through my stash, embracing the joys of braising season, knowing that summer will eventually come around again. 8 short ribs, about 2 1/2-3 lbs. 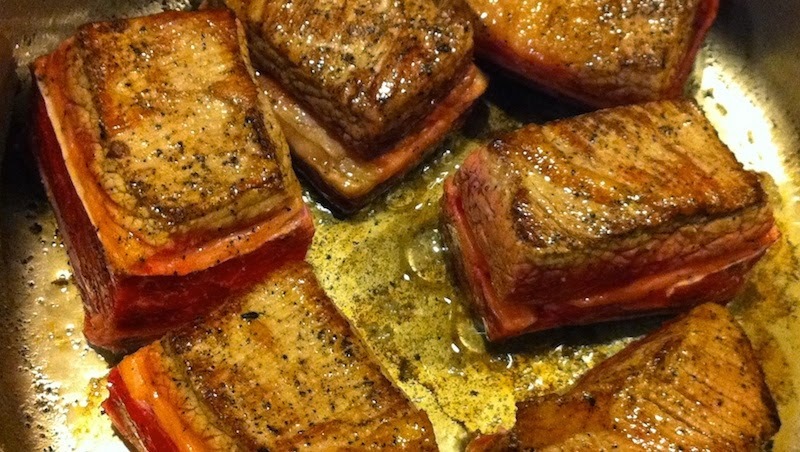 Remove short ribs from refrigerator and bring to room temperature. Salt short ribs on all sides. Put flour in gallon zip-lock bag (or small paper bag). Place salted short ribs, two at a time, into bag and shake to cover with flour, removing them to a platter as you do so. Heat oil in large Dutch oven. Add short ribs and brown on all sides. Remove to platter. Add onions to oil in pan, scraping up any browned bits in the bottom of the pan. Sauté till translucent. Add garlic and sauté briefly. Place pinch of saffron and salt in mortar and pestle and grind into powder. Add saffron-salt mixture, oregano and paprika and stir. Add olives, bay leaves, tomatoes and wine and bring to a simmer. Add short ribs back to pan. Cover and place in oven and braise for 2-3 hrs.